What better way to spend an extremely wet and very windy Saturday afternoon in February than sat in a warm clinic with expert Herbalist, Lucy Jones, teaching a small group of us the art of making Fire Cider? Lucy is based in the heart of Castle Cary and called ‘Myrobalan Clinic‘ and in the few years she’s been in the town she’s established a reputation for being an expert therapist, treating patients for all manor of ailments and patients travel from far and wide to see her. I am one of the patients for whom she made a huge difference and it’s thanks in part to her that I could attend her latest workshop and have taken up studying to become a medical herbalist myself. Five strangers gathered in her clinic, each equipped with an empty Kilner jar and a bottle of cider vinegar. 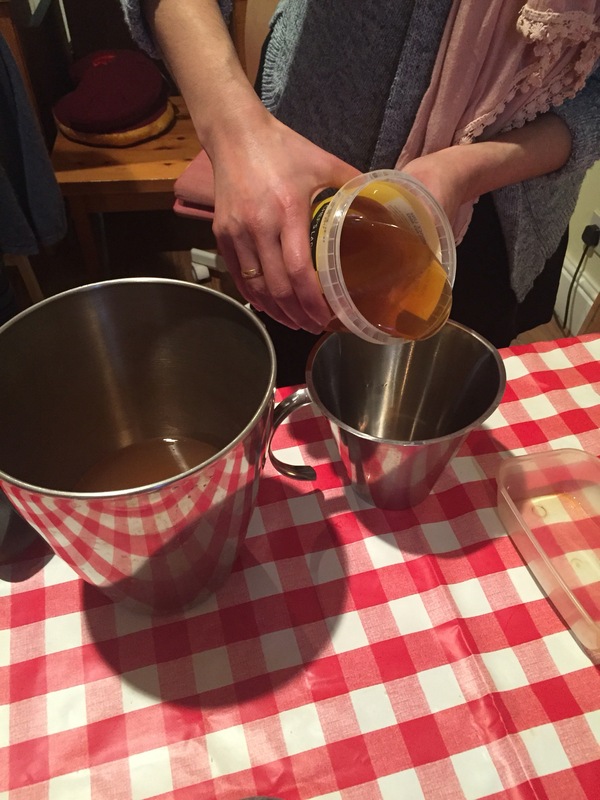 As Lucy welcomed us we were briefed on the benefits of Fire cider, Lucy’s mix is sold from her clinic and most of us were already familiar with its potent flavour and wonderful traits as a remedy to maintain good health and keep colds at bay. Although all the ingredients are widely known for their medicinal properties, no claims can be made of the effectiveness of them unless a from a qualified medical herbalist. The blend we were about to make was therefore for our own use and our family and friends, not to made for public sale, so you won’t be seeing any on my market stall! We began with a thorough washing of all our hands and returning to a prepared chopping board and a selection of extremely sharp knives, we began chopping. Fire cider ingredients. Photo by Bridget Cole. The first herb was ginger and generous chunks of root were distributed and we were instructed to chop as small as we could, leaving the skin on. One of our group, Bridget, is a trained chef and her rapid and effective chopping was admired by us all! After placing our chopped ginger in the base of our Kilner jars we all sat and were given a cup of infused ginger tea. In silence we sipped and were asked to notice the effects of the tea, with all our senses, tongue, throat, chest and even fingers! Lucy had prepared hand outs about each of the fire cider ingredients with information about the properties and history of each herb. Together we learned the subtleties of the herbs and how individually and combined they affected our bodies. After our ‘tea break’ we returned to work and began chopping the next ingredient, chilli. These were large, strong but also sweet chilli, and a beautiful bright red in colour. 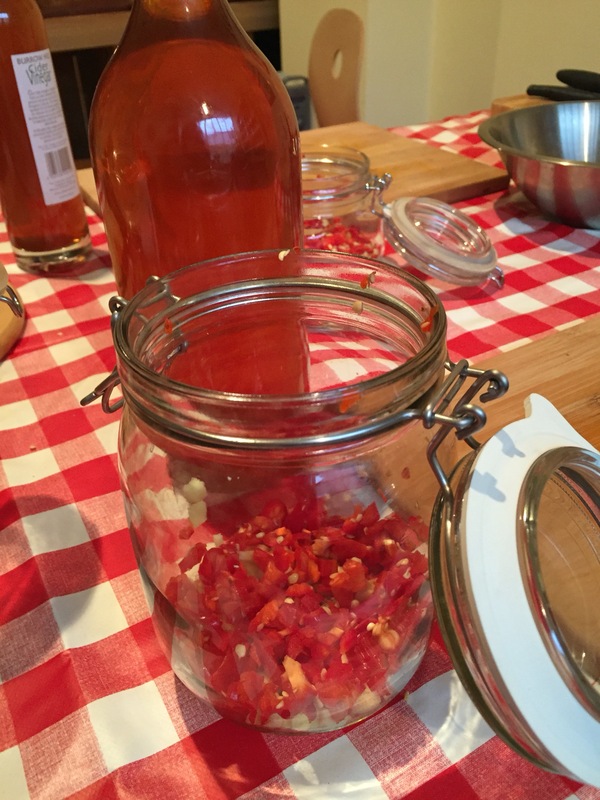 They looked fabulous layered in our jars and after a thorough washing of hands to prevent the tempting rubbing of eyes etc, we sat down and apprehensively sipped our Chilli tea. Being so strong, Lucy decocted the chilli then took one spoonful of the tea placing in our cups then added hot water. A surprisingly tasty cuppa, the chilli, although hot like the ginger, gave a different taste and physical sensation. We were told of its benefits and uses which fascinated us all. The next herb was horseradish. This had been grown & harvested by Lucy, then scrubbed clean and dried. It was pointed out the importance of using dry herbs so as to prolong the life of our finished mix. We were all a little apprehensive about the horseradish tea but again it was very easy to drink and we noticed yet more effects on our senses. Vicky had arrived on the course with the early signs of a cold and with her throat eased by the ginger and chilli, she found the horseradish cleared her nostrils. The rest of us found that our tongues were dried out, quite different to the saliva inducing chilli! Chatting amongst ourselves as we chopped up the onions and garlic to complete our mix. Sharing experiences of travels, home remedies and cooking along with learning the ideal place to plant our souvenir baby horseradish plants so as not to let them take over our flower or herb beds! 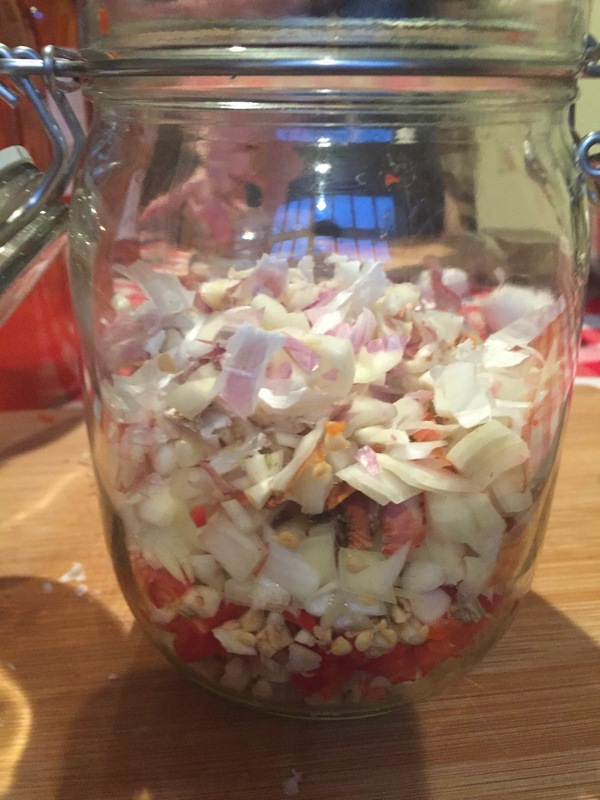 Jars filled with the ‘fire’. 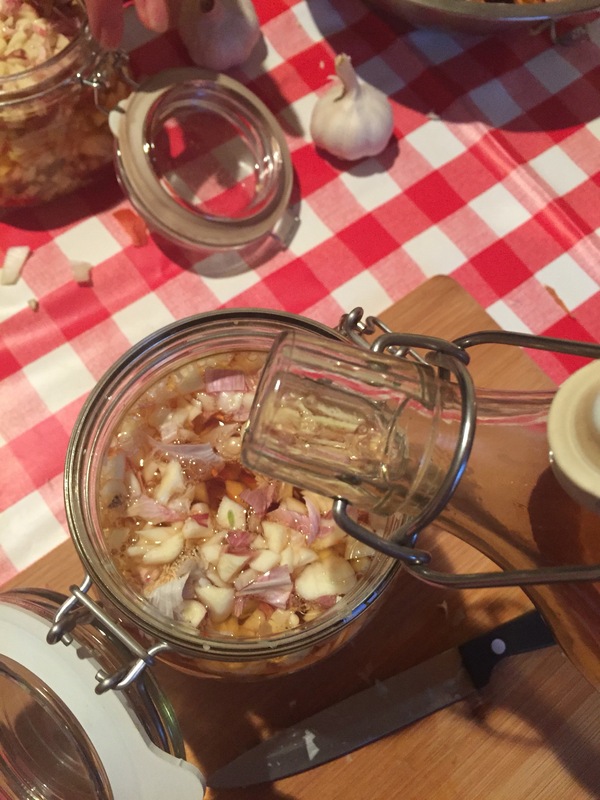 It was a relief to know that we weren’t offered onion or garlic tea after packing all the freshly chopped ingredients into our jars. Opening our selection of cider vinegars ( my husband makes cider and cider vinegar, available at theTuesday market in Castle Cary) we were then allowed to pour it into the jars coving all the herbs. The herbs should fill half the jar and then the vinegar can be poured to the top. Any metal lids should be lined with grease proof paper so as not to contaminate the mix. 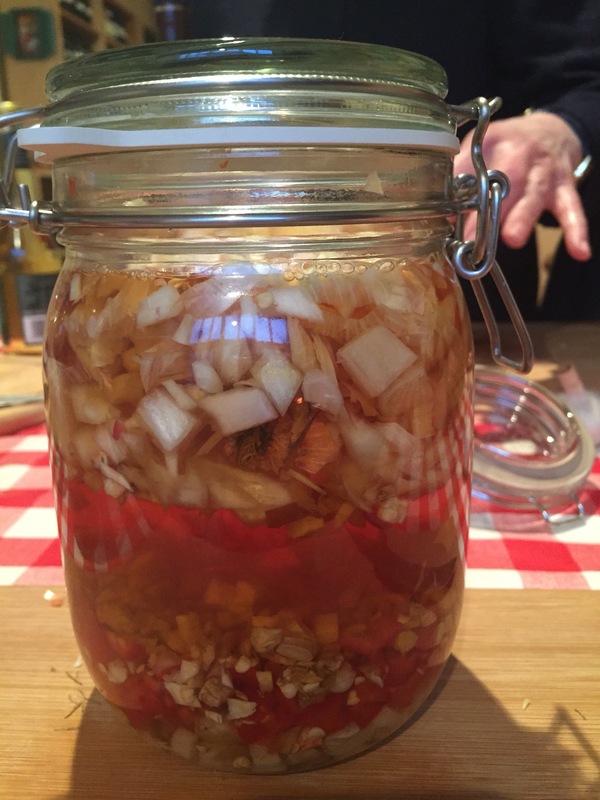 Our jars now looked beautiful with the golden and red colours glowing in the vinegar. Sealed the jars need to be stored in a cool dark place for at least two weeks before straining. Sealing the jar ready for storing. 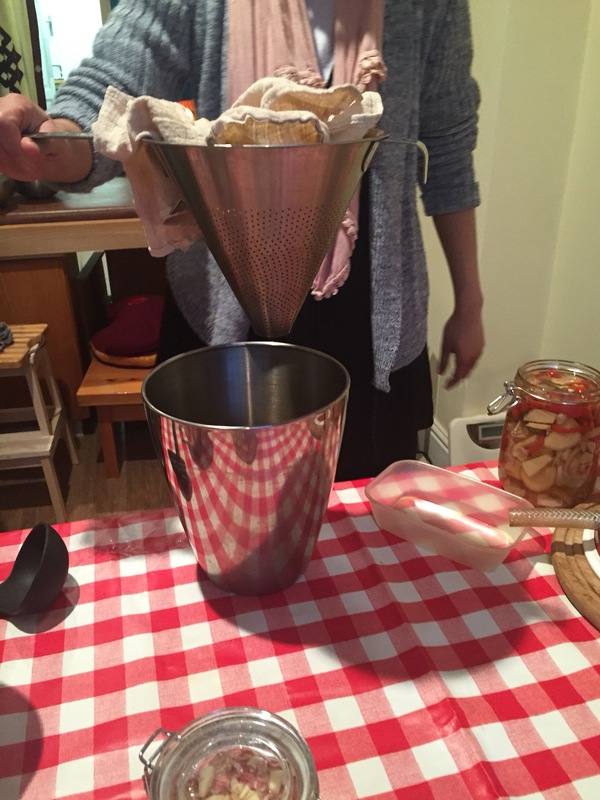 Lucy, and her assistant Sarah, had prepared a mix a few weeks ago and so they demonstrated the straining process. 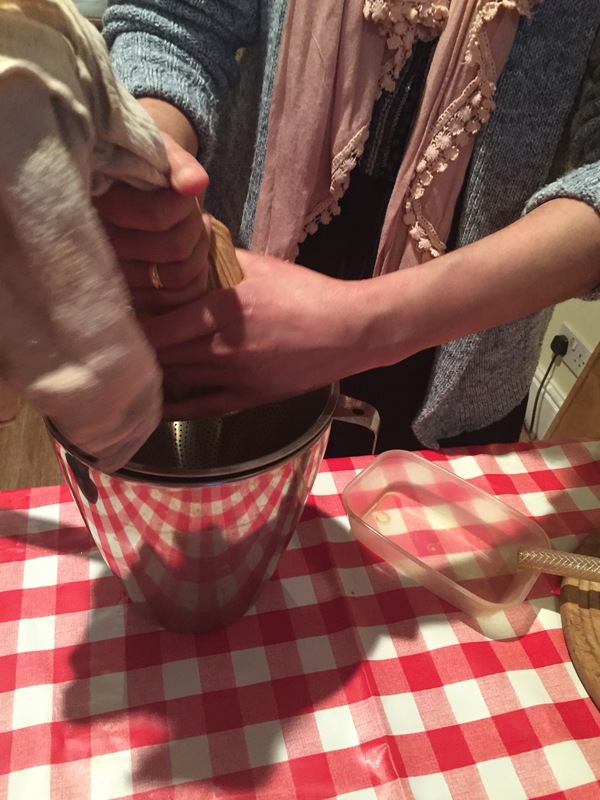 Sarah was extremely efficient in squeezing the last of the vinegar out from the muslin and so the mini press wasn’t really necessary, a shame for those of us eager to fill our kitchens with some herbalist gadgets! After straining, the mix is then sweetened by adding runny honey. Usually a third of the vinegar mix is a suitable quantity to sweeten it to s tolerable level. As a finale we then were each given a taster of Lucy’s Fire cider, my mouth waters just writing about it! Our bodies and souls suitably warmed before re emerging into the blustery and wet darkness of that Saturday afternoon. 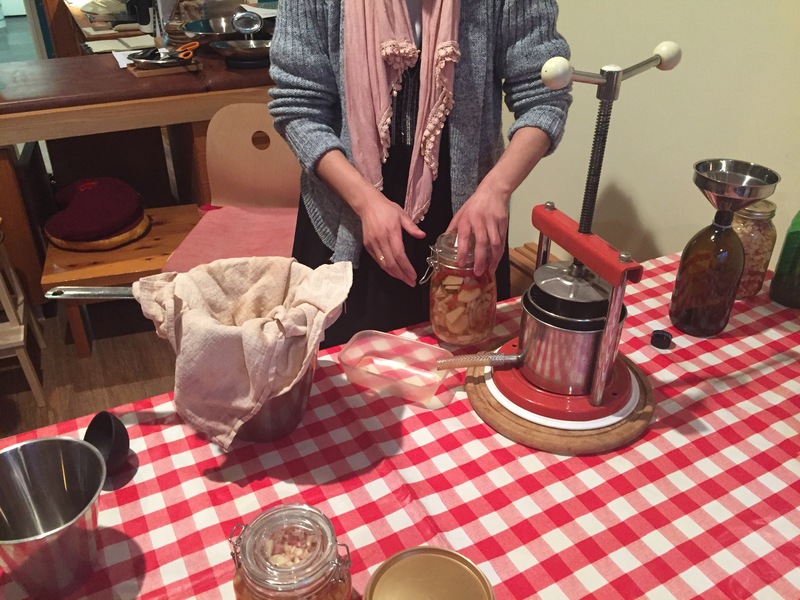 Lucy sells her Fire cider mix and a sweeter fruity version in her clinic.